Recently I started teaching myself Korean cooking and I noticed that one of the core ingredients – Gochujnag – has gluten in it. 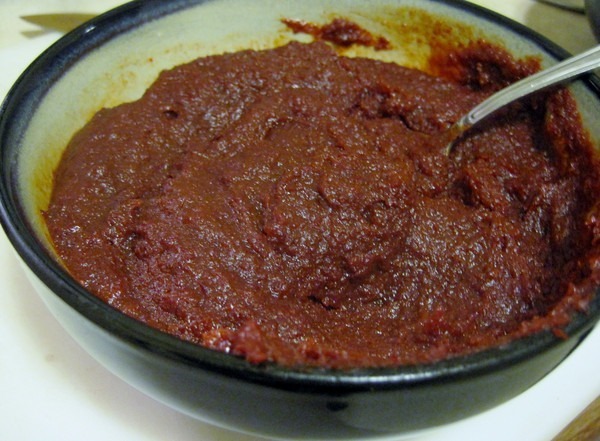 Gochujang is the Korean chili paste used in several dishes including Bibimbop. I went to many different Asian markets, including the Korean H Mart, and read the labels of every brand. Every single gochujang I saw sold in Seattle has gluten in it. It is very likely that you will be getting gluten exposure when ordering any dish at a Korean restaurant that uses chili paste. Sneaky gluten filler is exactly what I discovered when I researched commercial gyro meat. For this post, I want to thank Gluten-Free Veg-heads UNITE for their post Gluten-Free Victory!! Spicy Korean Bean Paste. They spotted in the Wikipedia how commercial production of gochujang took over in the 1970s and this was likely when gluten became a staple ingredient. Probably because it is cheap and acts as a preservative. Why it is there is of no concern to me. The important thing is that I am able to make my own gluten-free version. Using the recipe from Shizouka Gourmet converted by Veg-Heads and then adjusted my me, I made my own. 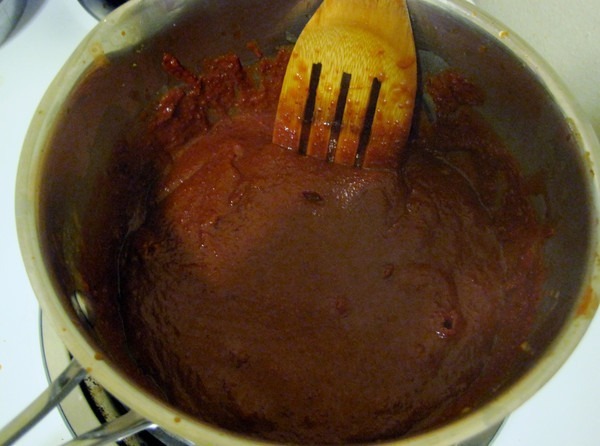 The directions are posted with photos on Korean Cuisine: Home-Made Gochujang. Here is the summary. Add water and brown sugar into pan. Heat until sugar is dissolved. Add Miso and keep heating until dissolved. Use a wooden spatula. Keep going until everything is smooth. After most of the water has dissolved, add the Korean chili powder and stir. When big bubbles start appearing, turn off heat. Let the paste cool and little and then stir in salt and rice vinegar. Jar paste. Shizouka Gourmet says it should keep for a year. 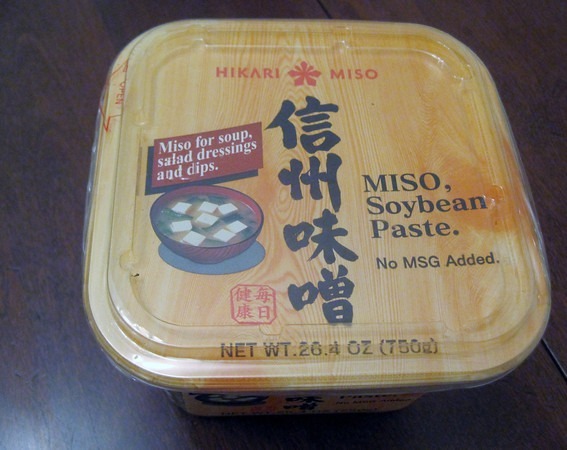 I avoid soy, unless it has gone through a fermentation such as miso or natto. I’ve made 3 clay pot dishes using my gochujang. They tasted great and without gluten. My gochujang was a little more on the sweet side than spicy. When I make this again next time, I will increase the amount of of chili powder. At some point if I continue to be interested in Korean cooking, I may ferment my own gochujang. Note that the Maangchi tutorial is not gluten free, so the recipe would need to adjusted. UPDATE November 2013: There now exists a commercially available GF gochujang. Oh man, I love gochujang! There’s always some in my fridge…really good on eggs or burgers or… anything really. The gluten doesn’t bother my system but I still find it annoying that they find it necessary to add it in. Most of the gochujang I’ve seen has high fructose corn syrup in it as well… annoying. @Dhammy – Great ideas. I hadn’t thought about adding it on burgers or eggs. I think I am going to need to make a much larger batch. How do you think you could convert her fermentation to be GF? I was thinking of using Coconut Palm Sugar instead of Brown Sugar. I wonder about the shelf life. @Liese – Maybe replace the barley malt extrct with this? No clue on the shelf life. I am going through this stuff too fast to worry. I am trying to ferment my own…any words of wisdom? I followed Maangchi tutorial and currently I have it in a food grade plastic bucket, open to the air in a warm dark place, but it is forming a white mold(?) on top…any thoughts? Her example showed it with a dry crust which mine isn’t forming (it’s been 2 weeks). @David – No idea. I decided not to pursue this ferment at this time. Maybe ask Maangchi? Your recipe produces a gochujang that is soooo much better than the hot pepper paste we’d been buying at H Mart. I’m glad to be rid of the MSG, gluten, unfermented soy, and corn syrup. We make bibimbap at home a couple of times per month and good gochujang is the critical ingredient — the sauce that pulls the whole dish together. I made a few modifications to your recipe. I used Raw Coconut Crystals instead of brown sugar to give a lower glycemic impact. I used No Salt instead of regular salt to keep the sodium content low. Other good salt substitutions might be Himalayan salt, a quality sea salt, or even Raw Coconut Aminos. Finally, I’ll use Raw Coconut Vinegar instead of rice vinegar the next time I make your fabulous recipe. Thanks to you, it’s bibimbap tonight! @David you’re suppose to expose it to sunlight of course bring it in if it starts raining. Also you shouldn’t use plastic it can change the way the bacteria ferment, plus plastic can still leech into the sauce. If you look how Koreans ferment Doenjang it is fermented outside in the sunlight not a dark cool place. Perhaps just changing from food grade plastic container to glass container will help. If you have a little spoilage at the top it’s no big deal you just spoon it out the rest will be ok. I know this because this is what my step mom used to do. I have watched my mother make gochujang all of my life. There isn’t any gluten in it? It does include sugar and pureed rice however. I have noticed deviations from traditional recipes in a lot of the shelved retail Korean products. 1/2 of the items don’t even taste close to items made from scratch. No Thanks! Homemade is the way to go! @M.Williams – Homemade gochujang is likely fine. It is the mass produced stuff that is problematic. Since this post was written, one brand has surfaced that has no wheat in it. I’ll do a post on it later. What is the gluten ingredient that you found in Gochujang? Thanks for posting, man. I heard about this stuff on a TV show about Korean culture and wanted to try it, but I was dismayed about the horrible ingredients in the Gochujang I found at Whole Foods, corn syrup, wheat, soy sauce ugh! I am going to pick up these ingredients and give this a try today. My girlfriend is a very sensitive Celiac’s. How can we find gluten free Korean chili powder? Even if there is only 1 ingredient, we are concerned about the risk of cross contamination. Any ideas anyone? Thanks. 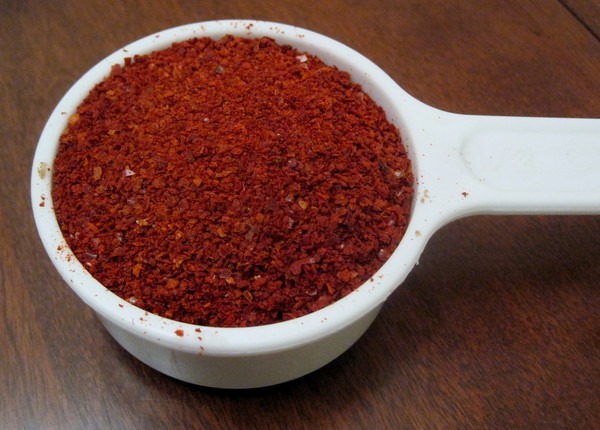 @Rahul – The powder is just hot peppers and salt. @Rahul – That isn’t the GF one. Look for one made with sprouted brown rice. Thanks for the quick response, MAS. Again, I know those are the only ingredients, but how can we be sure there is no cross contamination. I know, for example, that most of my relatives in the states who were born in India don’t trust many indian companies to not have cross-contamination. My girlfriend who’s had Celiac for years (I’m new to this) has explored various spice companies and notes that some are safe and gluten free while others are not. It’s even been hard for us to find other things like canned garbanzos that are safe. @Rahul – Another option if you don’t trust the Korean labeling is to dry the hot peppers yourself. A food dehydrator might work as well. @All – Closing comments on this post. It is being attacked by a SPAMMER. The SPAM comments have been removed.